Toast the nuts in a shallow baking tin in the oven for 4 to 5 minutes – you need them to go just a little darker to bring out the lovely toasted flavour. Allow the nuts to cool and leave the oven on. Top the carrots, leaving small ones whole and slicing bigger ones in half lengthways. Parboil for 4 minutes, then drain. Transfer the carrots to a roasting tin and drizzle with the maple syrup or honey and avocado oil. Roast in the oven for 12 to 15 minutes. Shake the tin to make sure the juices coat the carrots, then let cool slightly (they're better served when they're still warm). Rinse the sprouting seeds, finely chop most of the parsley leaves, then mix with the hazelnuts and slightly cooled carrots in a serving bowl. For the dressing, combine most of the orange zest with the orange juice, avocado oil, maple syrup or honey and 2 teaspoons of cracked black pepper. Pour over the salad and toss to coat. Chop and sprinkle over the remaining parsley and top with the orange zest for extra prettiness. 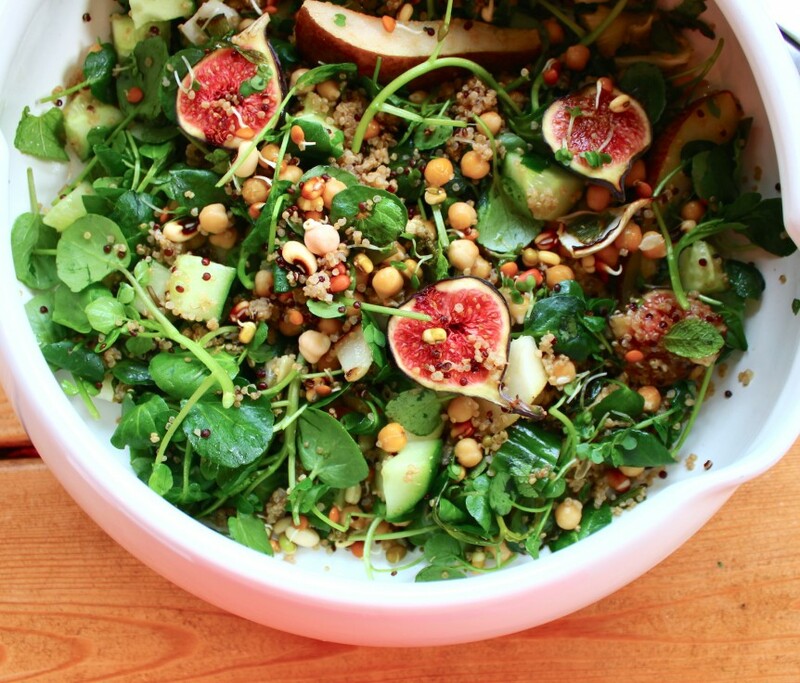 At Honeybuns they use Biosnacky sprouting seeds in this salad. These are easy to home-germinate, or you can buy them ready sprouted from Riverford Organic, health food stores and in the chilled section of some supermarkets. The seeds are a mix of mung bean, broccoli and white radish. You can heat them in a wok for 3–4 minutes with a little oil if you prefer not to eat them raw.